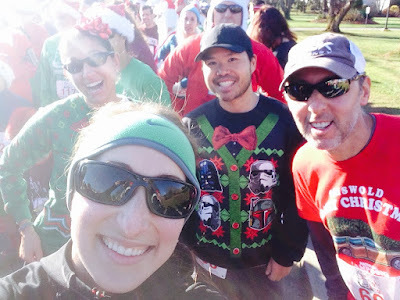 I have surprised myself with the result of just about every race I’ve run this year and yesterday’s Jingle Jog 5k was no different! We took this same pic in 2013! 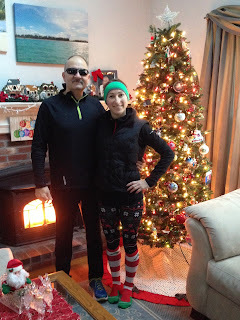 My dad and I signed up for the Jingle Jog together and soon learned that run club friends Danielle and Jason were also running. 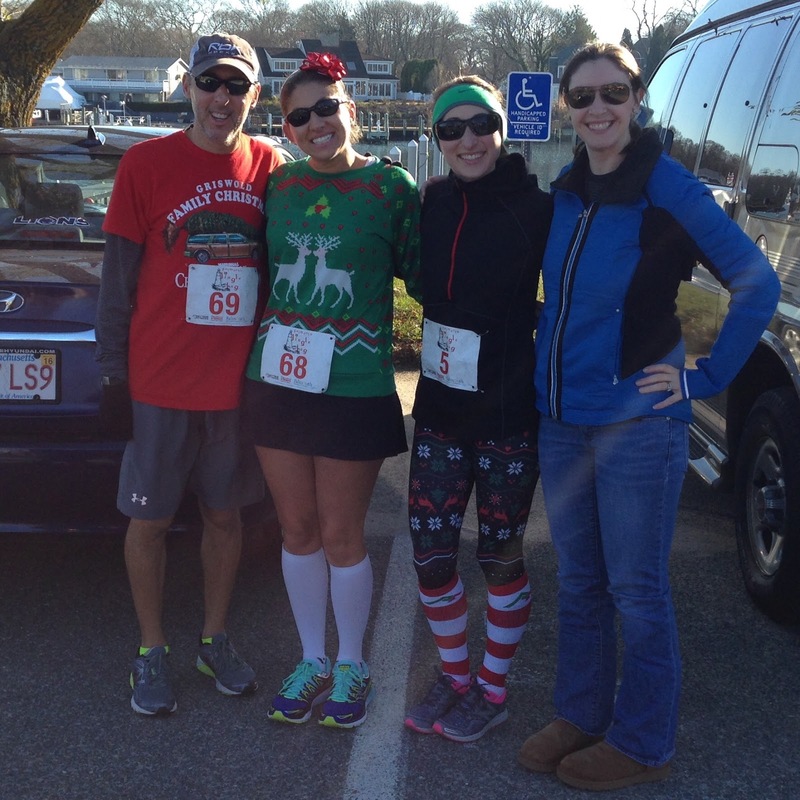 It’s always a fun and festive race—if you didn’t know I LOVE Christmas! The sun was shining and the weather was great for running on a December morning on Cape Cod. I had literally NO expectations coming into this race. My focus is on Houston and I’m deep into marathon training. In fact, I ran my long run of 18 miles (the longest so far) on Friday afternoon so there was not much turnaround time to recover. When I woke up Saturday morning my first thought was “Why would I ever think singing up for a 5k the day after an 18 miler was a good idea?” The first step out of bed both my Achilles seized up and my calves screamed. My hamstrings were tight. My hips were sore. Pretty much everything hurt. I met up with Danielle and Jason along with their friend Pat for an easy 2 mile warm up at 9 minute/mile pace. Oh my were my legs tired. Jason asked me what my race plan was and I literally said, “Survive feeling good.” No expectations. When the gun went off, I just ran. 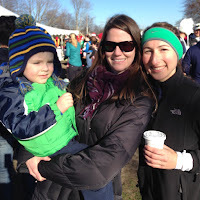 There were a bunch of kids at the start that I needed to get around and once I passed them I stayed pace and settled in. At this point I was the second female and as weird as it sounds running fast actually felt more comfortable for my tired legs. I hit the first mile in 6:30 before crushing the Falmouth Road Race hill—I actually love running that hill—and slowing down a bit for mile 2 (6:36). With a mile to go, I felt like I was slowly catching up to the first female, Anne Preisig, so I just kept trucking along. Side note: Anne was my high school cross country coach and is at every single road race I run. And she wins them all! With a half mile to go we turned back onto Scranton Avenue with the finish line in sight. Glancing down at my watch I knew 20 minutes was within reach and that gave me some extra motivation to push to the finish. Anne said something to me as I passed her but I wasn't really paying attention. I last broke 20 minutes in a 5k back in high school on at Franklin Park’s cross country course and that 20 minute mark has been on my mind for the past few years. I never, ever thought the Jingle Jog in Week 10 of marathon training would be when I did it! My watch beeped 6:11 for mile 3 and my official finish time was 19:50.1. So happy! My dad also ran a PR. 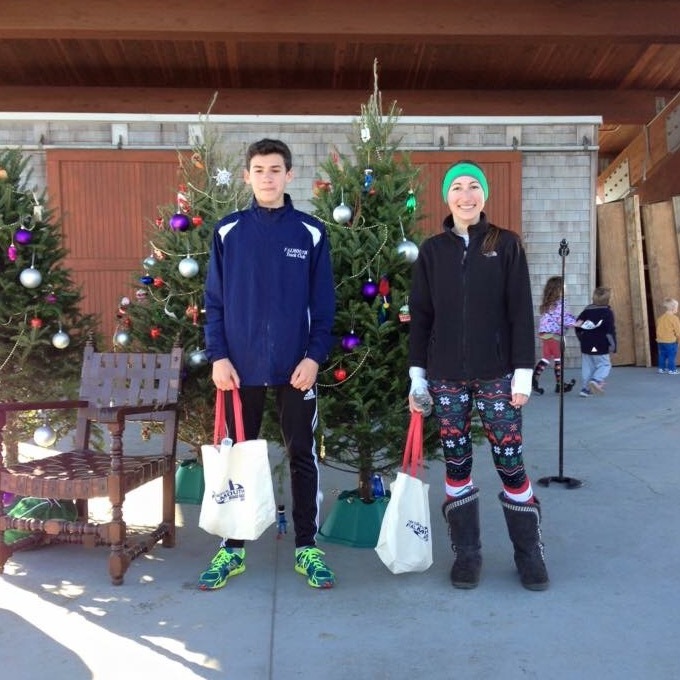 Danielle & Jason ran a fast time. Thanks to my cheerleaders Allison & Catherine and Sarah & Landon! Before I wrap things up, let's go back to this Anne thing. This was the first time I’ve ever beaten her. I don’t usually even try. I’m the kind of person to run my own race and pick people off around me but not with a “place” goal in mind. Because really, who cares? (Unless of course it’s the 50 Yard Finish when I was chasing down a Buffalo Bills age group medal! 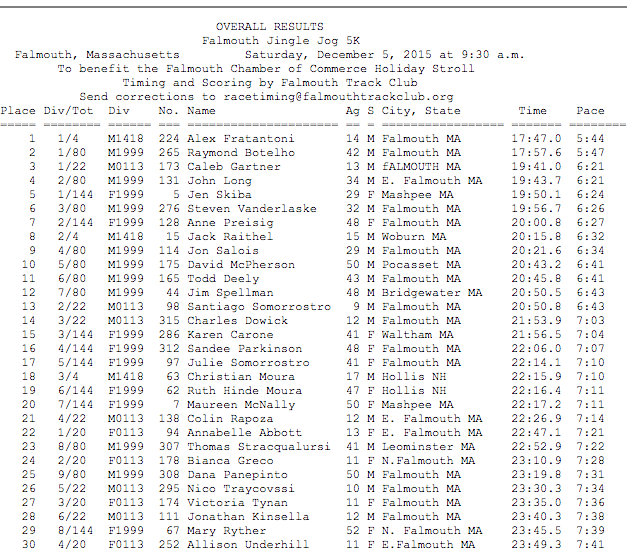 #billsmafia) But anyways, first place won a free entry into the 2016 Falmouth Road Race—a big, sarcastic woohoo! 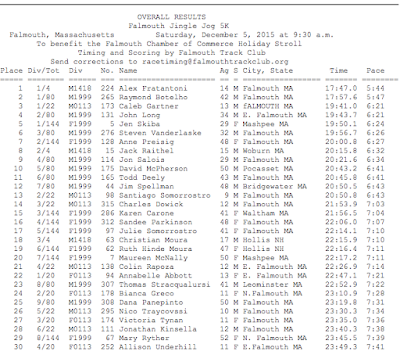 I used to work for the Falmouth Road Race so I don’t really need it to register. I will take the extra 2015 mug though. The other ironic part of this whole story is is that second place won an Anejo gift certificate. ANEJO IS MY FAVORITE! I'm not kidding, it's my favorite. Usually when I race Anne, second place gets nothing! Whatever. The burrito waiting for me the night of the Houston Marathon will be better. And guac. And chips. So many chips.